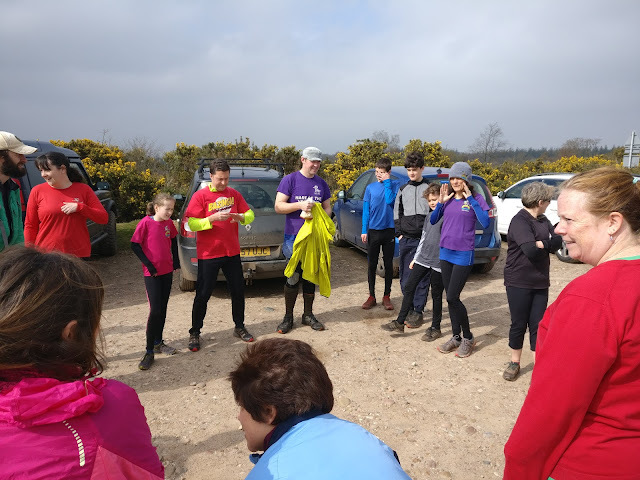 Well over 20 hashers gathered in the car park on this lovely sunny day, a very bizarre contrast to last weeks snowy hash. In the hash circle we were given some very odd instructions by the hare. It was to be a wet hash and by purchasing 'get out of water free' cards from our sheriff, we could avoid the water! 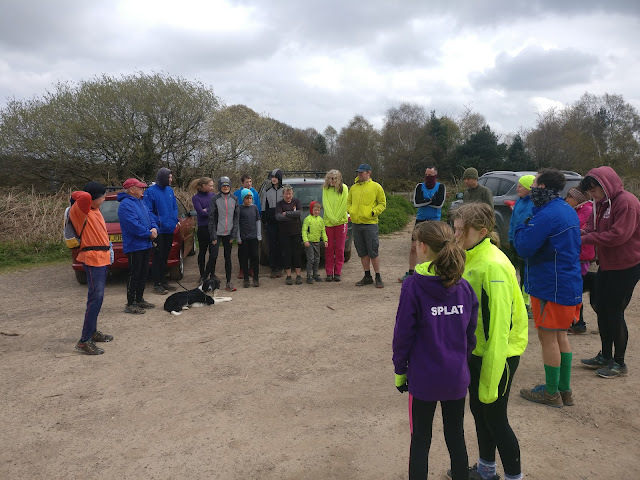 Also there were 2 sweetie stops, which attracted a cheer from the hashers, but they were sweetie stops with a difference, all would be revealed on the hash. We welcomed some new hashers today, one of whom was Horny Womans daughter, some visitors from Otter Valley Hash and the return of Flat Foot and Down Below the latter having been in Australia for a while. After checking it out On On was then called to the first water obstacle. The cheats among us went up over the bridge across the main road, the brave souls apparently ended up going through the tunnel that went under the main road, after going through the stream first though! At the check we went up through the village onto the next water obstacle which was tackled by a few hashers though most opted to pay the fine to the sheriff. Back out to the main road we set off up the road only for half the pack to have to be called on back by the hare for setting off in the wrong direction. We crossed the road and headed back towards the car park, what a nice short hash we thought, though we then ran past the turning onto a hash halt a little further down the road. 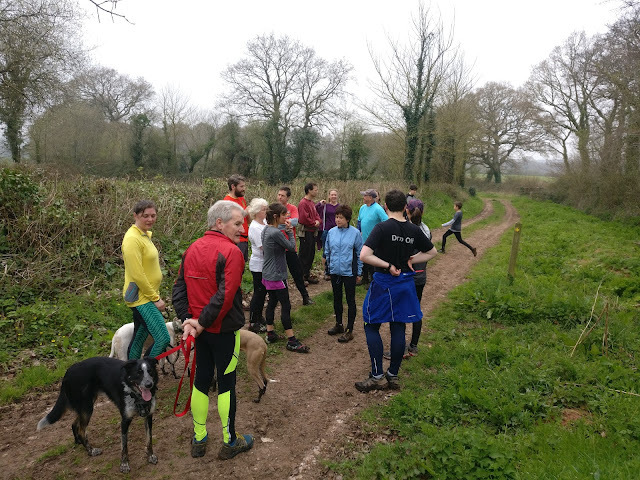 With the pack back together again we headed up a very large hill where Tuned In was struggling, this being her first running hash for a good long while, however when Radiohead overtook her despite carrying Radio Ga Ga, she was seen to be running up the hill. With Twin Peaks and Stat Nav out front we continued up hill before heading down a very muddy track and onto the first sweetie stop. When the hare arrived we were told it was actually an 'F' stop and we would find something beginning with F between the two sets of markings. Quite quickly the homemade fudge was found and while we had a group hash flash and enjoyed the view, we ate Blobbys homemade fudge. After a long/short split which took the shorts about 100m down the hill, we were onto the next sweetie stop where X-Bitz found the sweets hidden in the bush. Todays delights were sherbets and funsize Bounty bars. On down the hill we went with a nice stretch of road which ended up with us at the next water hazard. Scarf Face, Flour Power, Bell Toll, Tampa and Odd Bitz were among the hashers who braved this one with Tampa and Bell Toll promoting hash violence by starting a water fight. After a very muddy but flat long stretch of track we went through a field and were greeted by the On Home. Back in the car park the fines were handed out to those hashers who didn't partake in the watersports. Radiohead was fined (isn't he always) for nearly dropping the baby, Blobhoblin was fined for being age-ist by putting 'Tampas rest stop' next to all the benches on the last stretch. Up Yours was fined for having excuses why she had missed last week and Chip Shop was missing this week. On On to next week at Warren CP, Woodbury.